Print On Foam Decor-Props - Dino Rentos Studios, INC. Welcome to the next level of 2D props!! Our Print on Foam Props are affordable, lightweight, and best of all, they are customizable. These units work great in place of 3D carved foam props. Use the Print on Foam Props for Window Displays, Parties, Room Decorations, Trade Show Displays and more! Print on Foam Props are FLAT props that are manufactured with a FOAM SILHOUTTE BACKING that is then applied with a single or double sided VINLY PRINT. These units are NOT 3D. The units do however; provide the ILLUISON of being 3D with its foam silhouette backing, adding depth and shape to the prop. These oversized Print on Foam Ducks and Dawn Soap Props were used for Dawns' Celebraiton of 40 Years Helping Save Wildlife Event. How cute are these Print on Foam Dog Food Signs! Great for hanging in retail or displaying for events. Custom Foam Print on Foam Logo manufactured for North Carolina A & T State University. Print on Foam Bookend and Logo Props for Tradeshows and Conferences. This Print on Foam Entrance Prop is a great option for Tradeshows and Events! 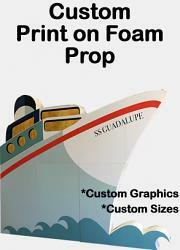 This Ship Print on Foam Prop was a great show stopping display for a corporate event. This Print on Foam Prop is great for "Selfies" at any party or event! This Print on Foam Boom Box was used as a Drink Serving Station for a client's company party. Provide us with your custom graphic or choose from our inventory of graphics. Custom Print on Foam Logo is a great cost effective alternative to a full 3d carved foam prop. Great for tradeshows, events, and even lobby displays!